One of the things you love about this city is that eventually it all comes to you. Whether it's leggy Brazilians or mod Europeans, this sultry sandbar attracts a world of sexiness. How fitting, then, that the designer determined to dress you in pheromone-charged glamour has also washed up on our beachy shores. Introducing the Tom Ford collection, available now at the Webster Temporary boutique, and your only spot in Miami to score the provocative designer's gentlemanly goods. Currently in stock from the man who sexed up Gucci: his well-heeled, aristocratic-heavy fall line, complete with wool pullovers and cashmere T-shirts. Do a little digging and you'll uncover a few pinstripe three-piece suits with plaid bow ties (sort of a cheeky British banker look). Or you can get custom-fitted for a chocolate velvet blazer, perfect for an early-December Art Basel party. 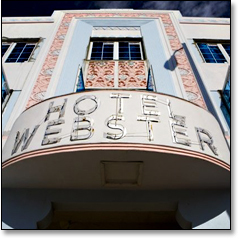 Usually you'd have to trek to Ford's flagship in New York to bask in this sartorial bounty, but luckily the owners of the Webster used their contacts in the fashion world (having worked at Lanvin, Gucci and Jil Sander) to bring the line to South Beach. It's all about collections. We mean, connections.